There are almost as many varieties of camo patterns as there are terrains to use them in. These patterns use colors found in the environment that the pattern is designed to disappear in. For example, the current camo issued to United States military personnel in theaters in the middle east utilizes the shades of tan, pale yellow, and brown that are present in the desert climate. Woodland camo is no exception to this rule. The woodland camo design is a pattern of blacks browns and greens. It is one of the most easily recognized patterns of camouflage because of it's extensive use by the United States Armed Forces. It is also extremely popular with hunters in the southeast United States, because it is perfectly suited for that terrain. Woodland camo ghillie suits have been designed specifically for use in the heavy woods. 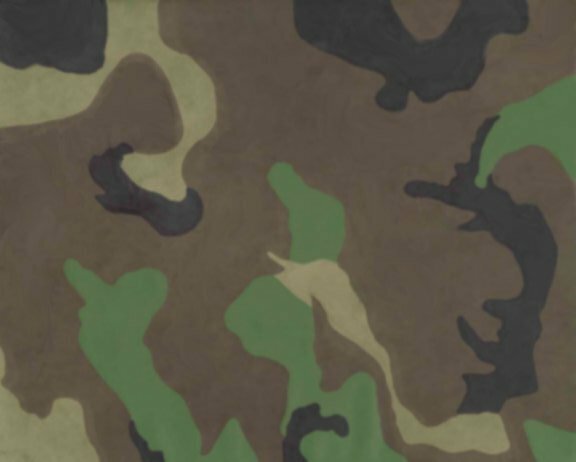 Other countries that have adopted the use of the woodland camo pattern are Albania, Argentina, Bangladesh, Bolivia, Bosnia, Chile, Colombia, Croatia, Ecuador, Estonia, Ethiopia, Guatemala, Honduras, Iran, Israel, Italy, Ivory Coast, Jamaica, Jordan, Latvia, Lebanon, Libya, Lithuania, Luxembourg, Macedonia, Mexico, Morocco, Netherlands, Nicaragua, Nigeria, Oman, Pakistan, Paraguay, Peru, Russia, Sierra Leone, Slovakia, Slovenia, South Korea, Spain, Sudan, Syria, Turkey, Venezuela. Besides Military and Hunting applications, the woodland camo pattern has found it's way into the fashion world. Forward minded designers in Paris and Tokyo have begun to incorporate the woodland camo pattern into their fashions. It is not uncommon to see, on the streets of Tokyo, children and teenagers wearing United States Army surplus, as well as nontraditional items, like shoes or dresses, made out of the material.